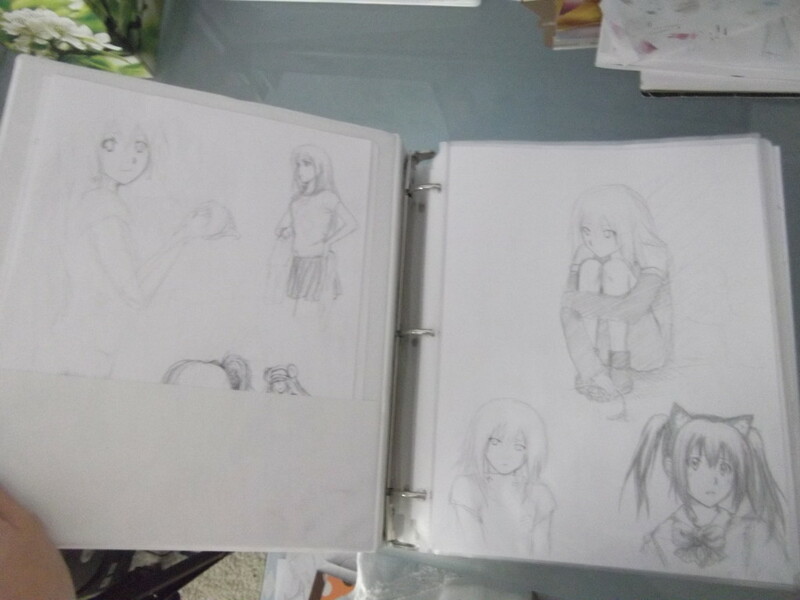 I happen to draw a lot of my traditional art on regular printer paper. 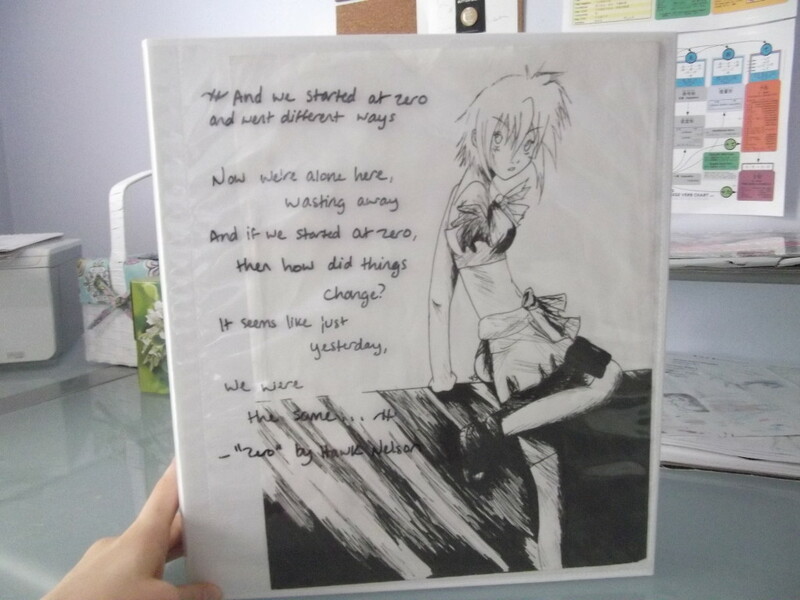 ^^; This means that not only have I gone through a lot of printer paper, but also that I have a lot that needs to be kept somewhere. For me, I think binders really make a good storage solution for stacks of 8.5”x11” paper! Just get some clear sheet protectors and a few large binders and organize away! 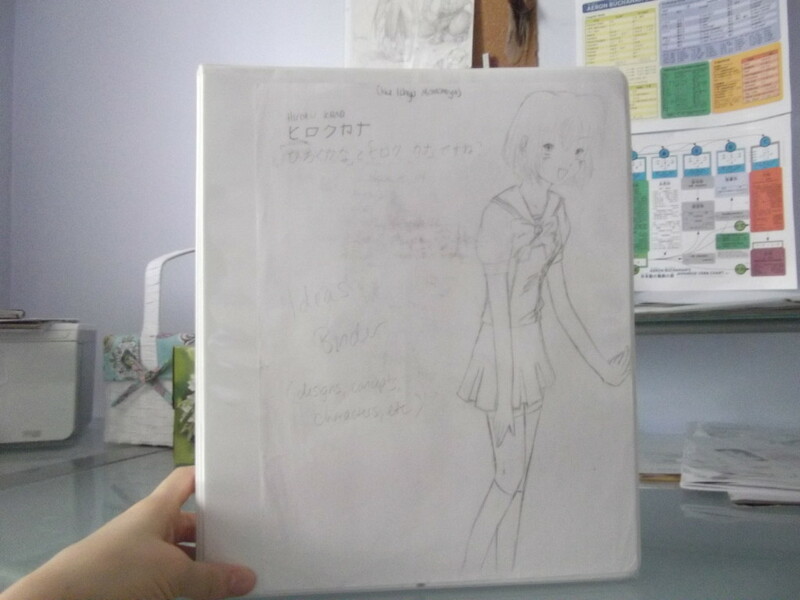 I have divided my traditional art up into five binders, each one containing a specific category of art. 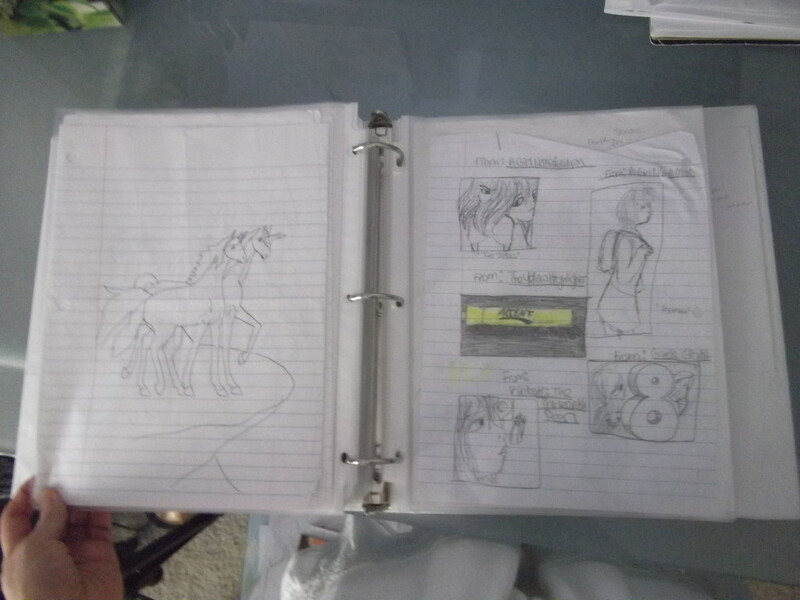 (Now, of course not all of my traditional art is stored in these binders, but a good lot of it is.) 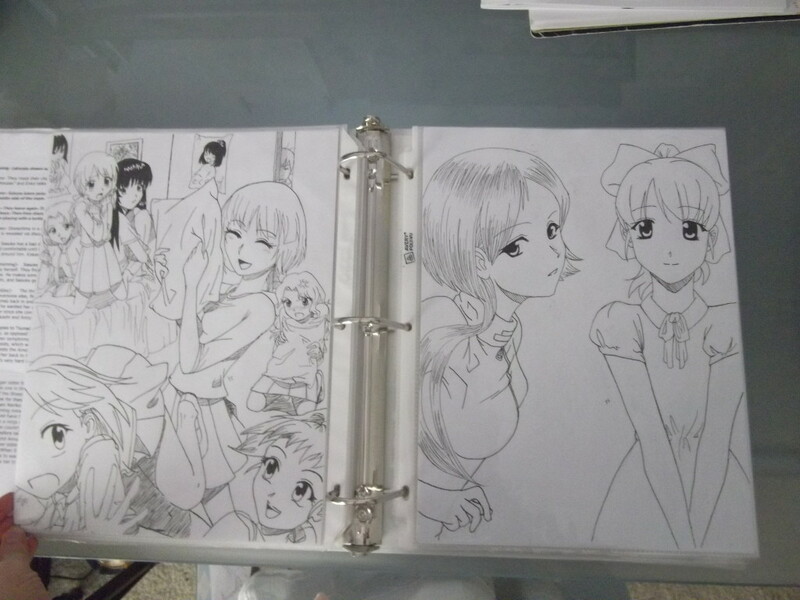 Can you recognize some of the drawings? 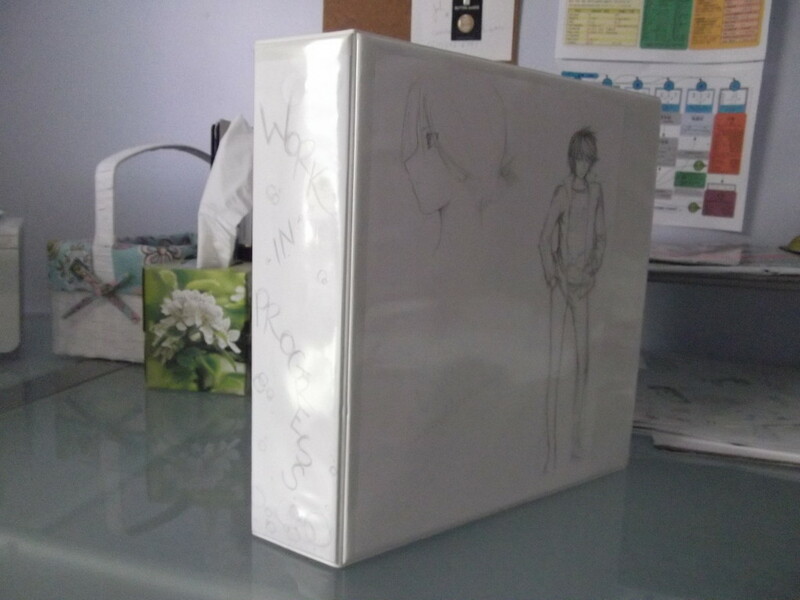 First up is the “WIP (Work in Progress)” binder, which contains (obviously) works that I intend to finish at some point. 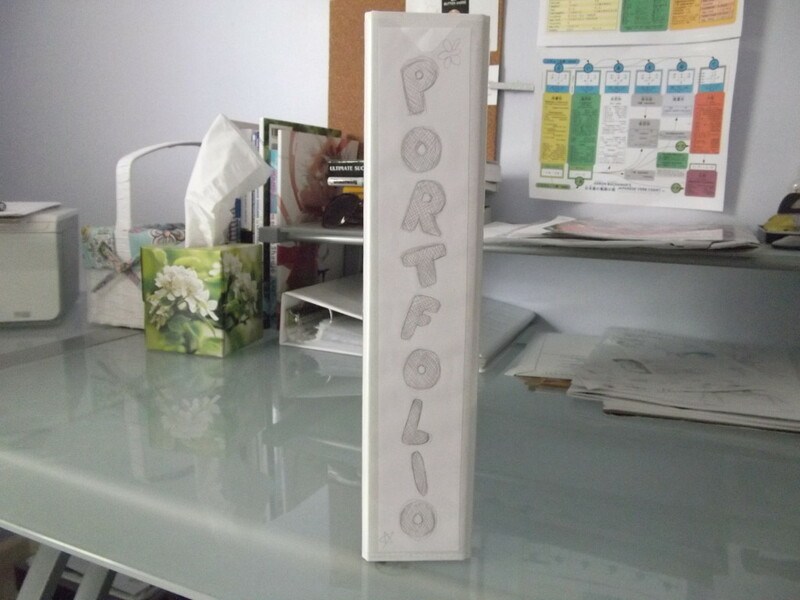 Once they are completed, they will be moved into the Finished binder, or the Portfolio binder if I feel it necessary. 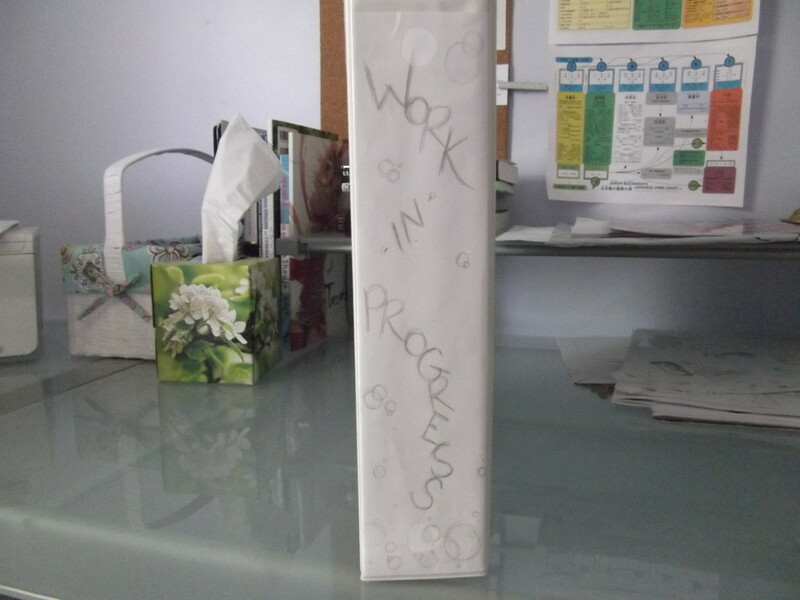 This is one of the two pictures I sent in with my first AIS lesson. They were kind enough to make copies of them and send them back! (I’d been told I wouldn’t get them back). 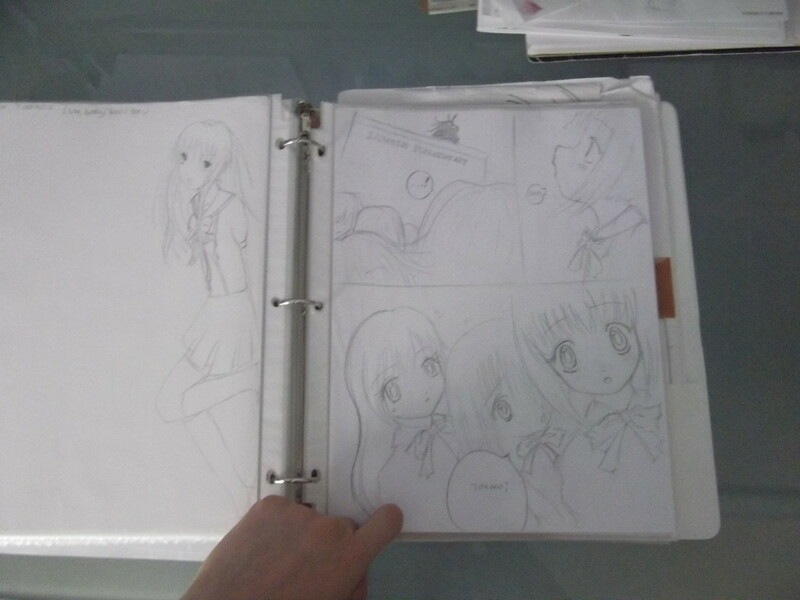 Drawn at my mom’s work carefully after recovering from my slight hand injury that Thanksgiving weekend (so…late 2011). It’s a part in Urami’s story where she actually does duel, and that duel disk is a borrowed one, thank you very much. To the left you can see something I drew on vacation that same year. 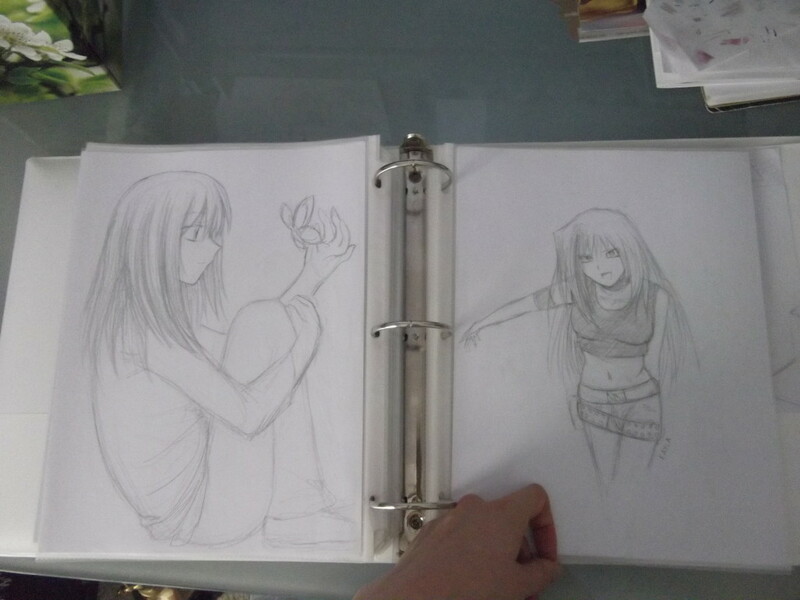 Left – old sketch I revived upon finding it again; Right – an old YGO! OC, Kayla. 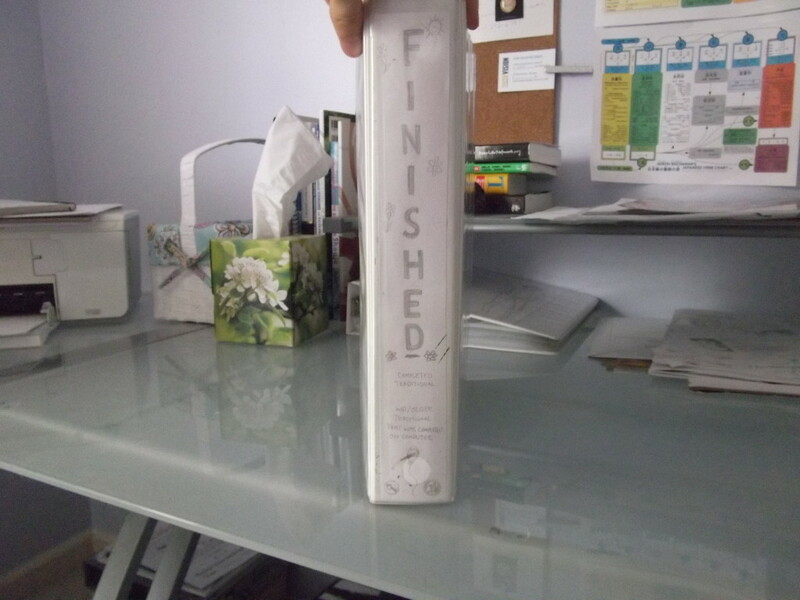 The “Finished” binder contains art that is, of course, finished. Usually this means that it’s been uploaded to dA or somewhere else, but it can also mean that it was simply scanned into the computer. 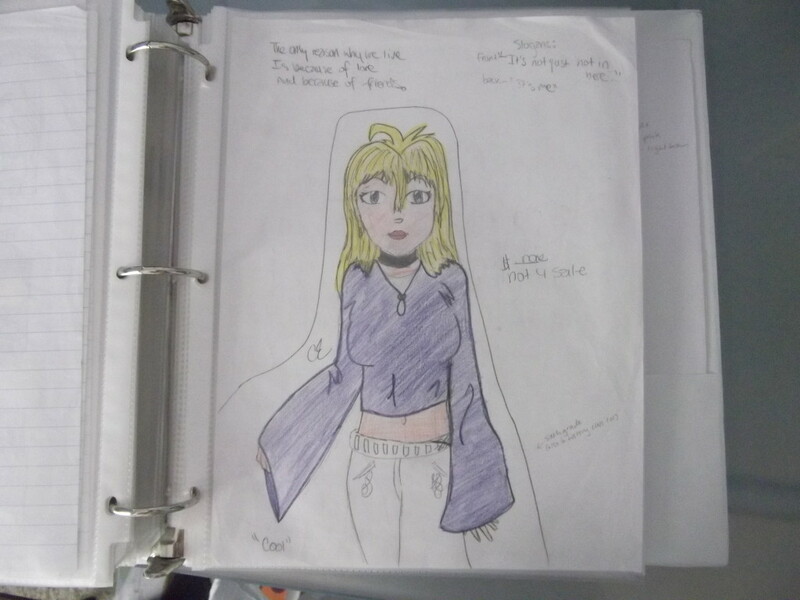 It includes WIPs and sketches that I scanned in and finished digitally, or recreated entirely digitally. 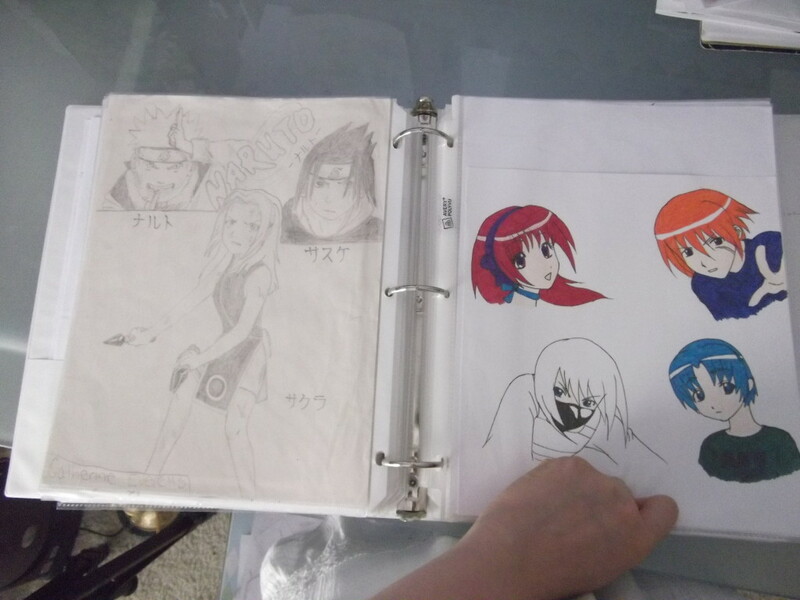 The dates of the work in this binder vary greatly, since it even includes art from 2004 and earlier, before I even knew manga existed. These sketches can be found on my Tumblr. 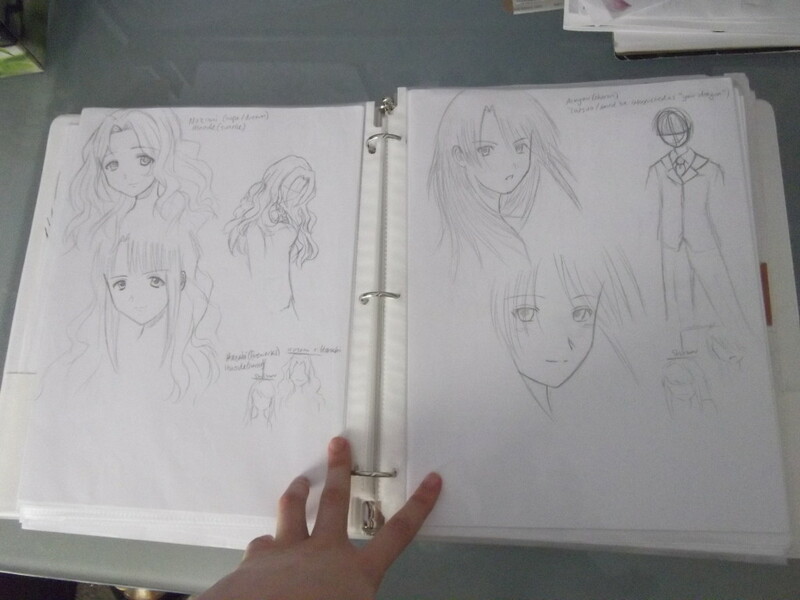 I drew a lot of horses and not-so-realistic people before I discovered anime. Here’s a sixth-grade example. 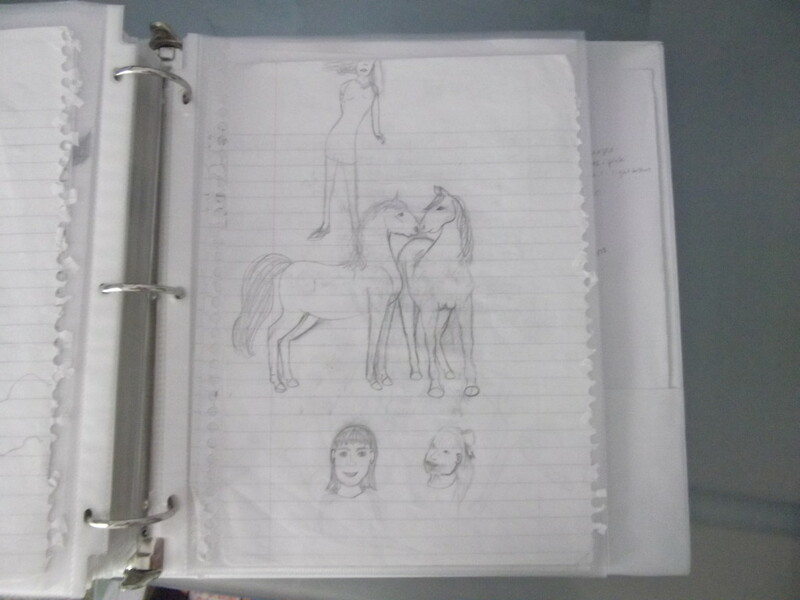 The unicorns were for a short story I wrote in Reading class, and the other page is something I drew in Social Studies class–it’s basically a handful of pseudo-book covers. The blobs down there are people…….. Again, likely from sixth grade. Never uploaded. 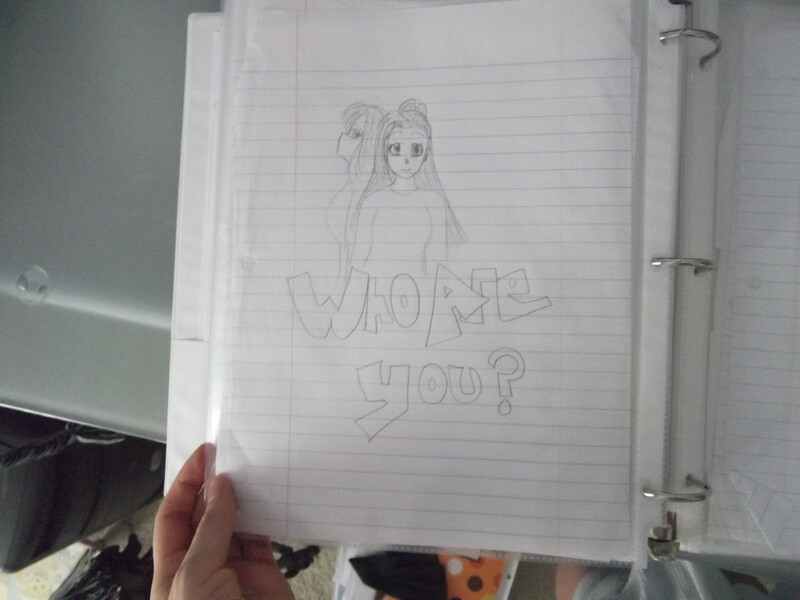 “Who are you?” Pretty sure this one is from either late sixth grade or early seventh grade. Never uploaded. 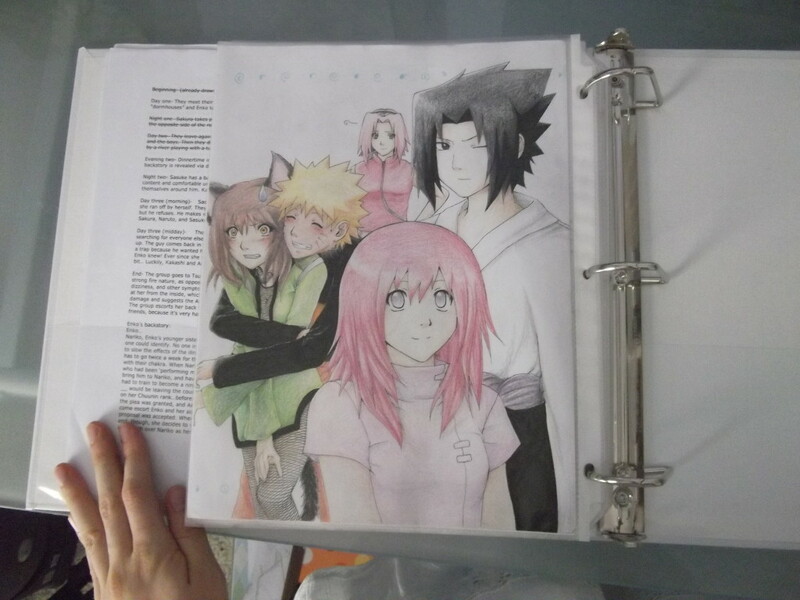 This picture was one of the best ones I drew in this style in sixth grade. 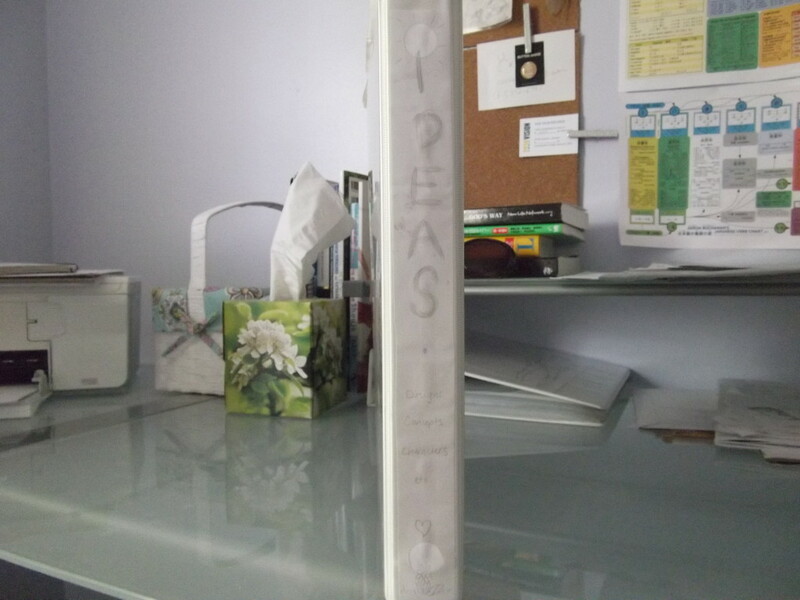 I was so proud of it at the time. Never uploaded. 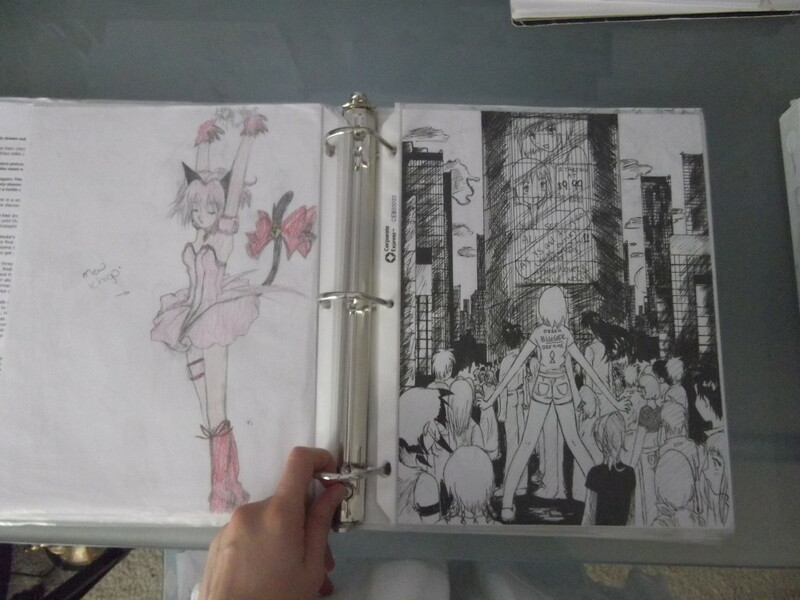 These two pictures are from seventh grade, when Tokyo Mew Mew was a heavy influence… Never uploaded. 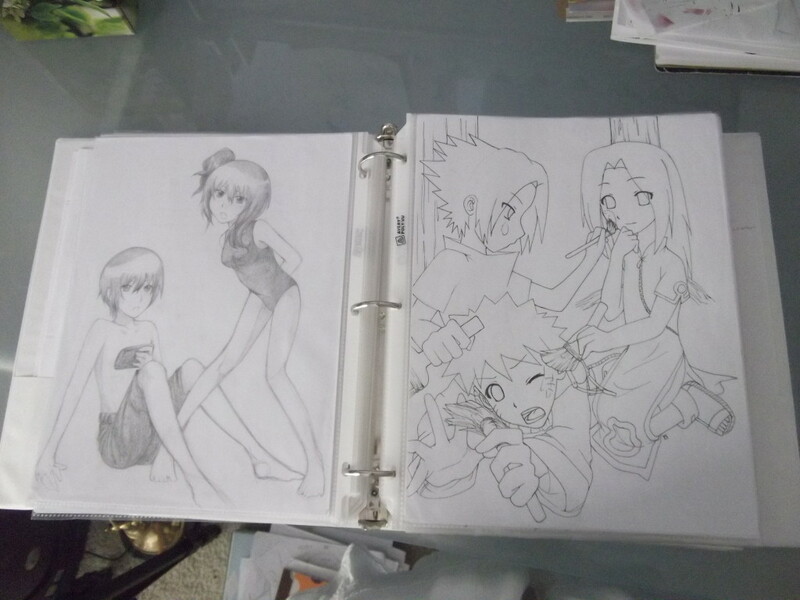 These two pictures are also from seventh grade, when Tokyo Mew Mew was a heavy influence… Never uploaded. Uploaded on deviantART, I think? Characters for a scrapped original story. 2008. Random story idea that I never used. Never uploaded. 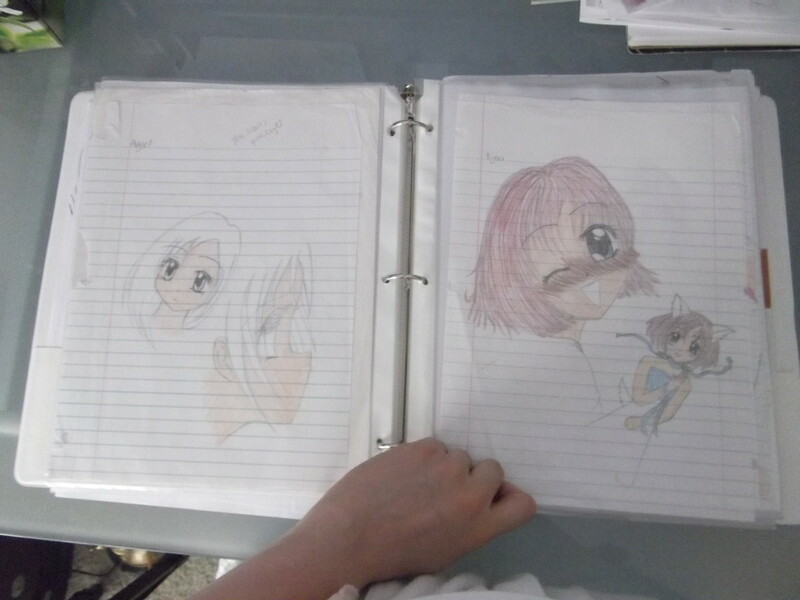 Lastly, the “Portfolio” binder contains art that I feel represents my very best at different periods in my life. 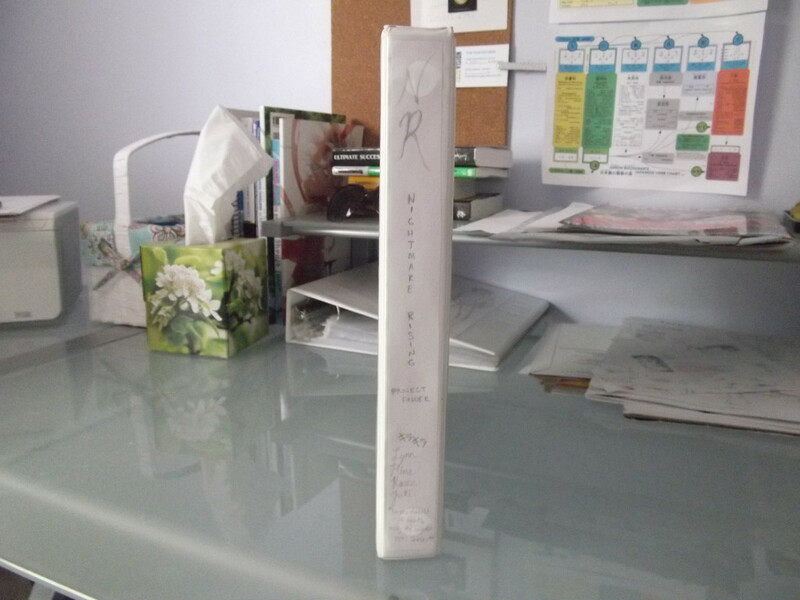 If I am especially proud of a traditionally-drawn picture for whatever reason, it goes in here. 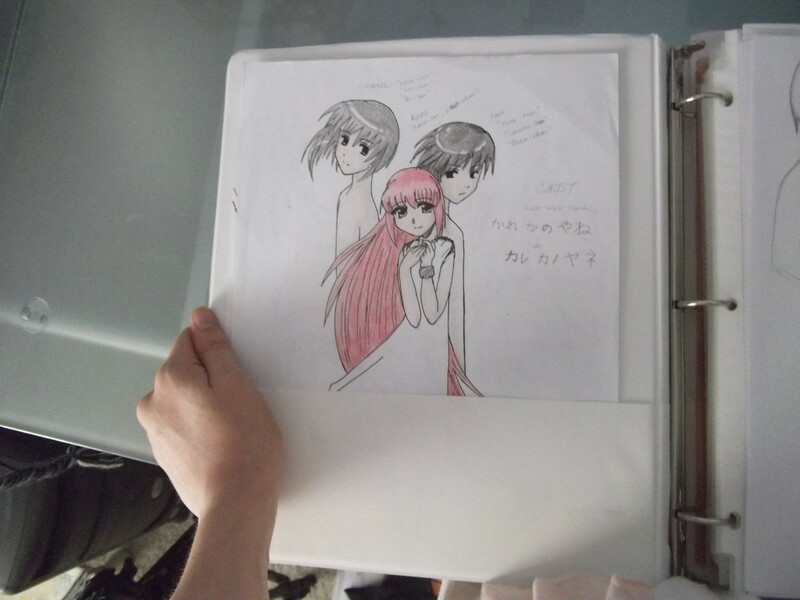 I think this is on deviantART…? 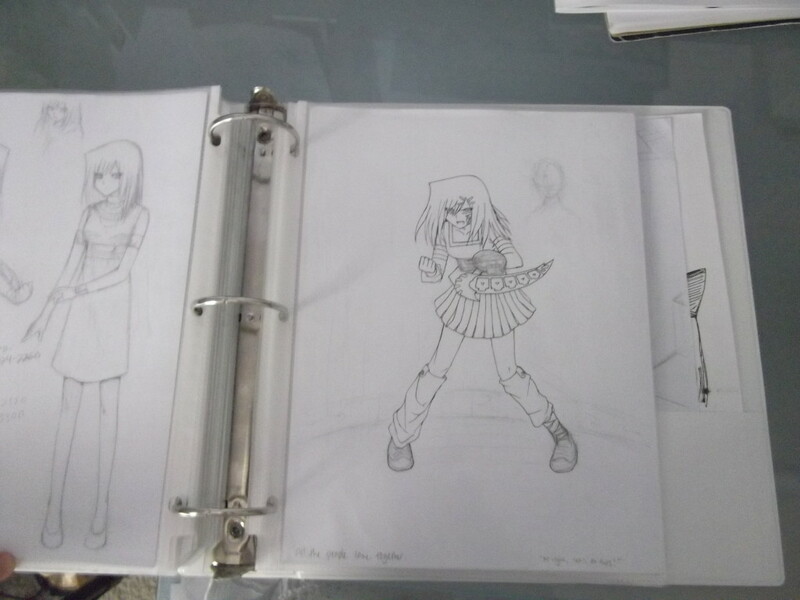 It’s really fun to look through these binders because it brings back memories of where I was when I was drawing those pictures, or what my ideas for the stories were… It’s also amazing to see how much I’ve improved! 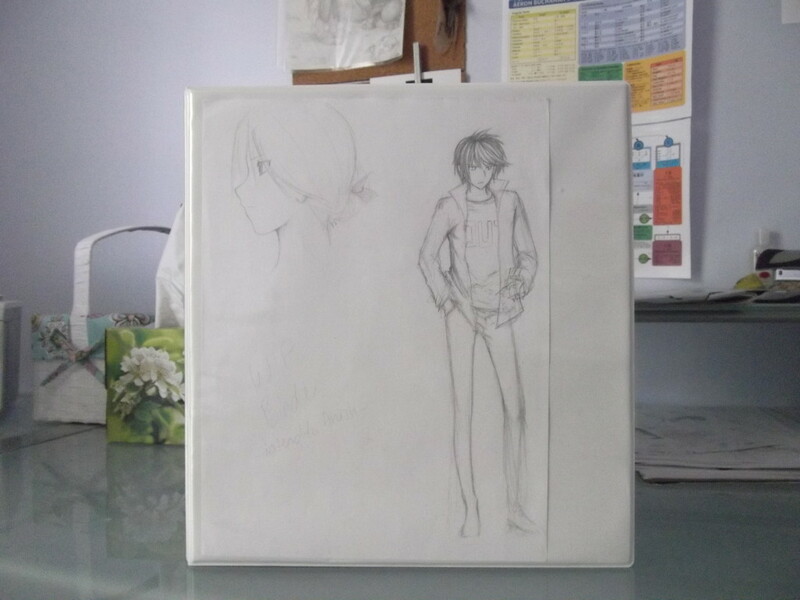 (^-^) How do you organize your traditional art? Let me know in the comments! Yes! We sure do. There’s just something about drawing on paper that even the best tablets and digital art programs can’t reproduce. 🙂 Thank you! 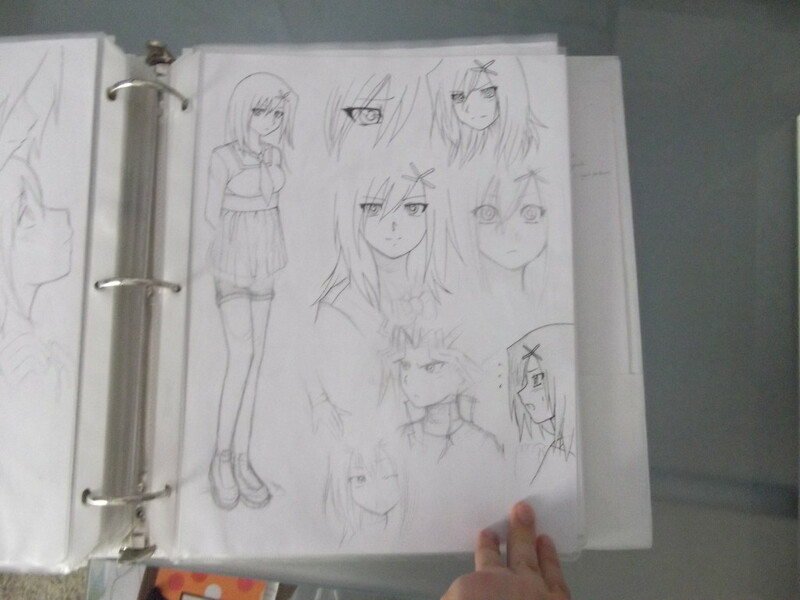 Haha, yes, I drew even on returned test papers sometimes! That’s cool, though! Do you still draw?